In PLoS ONE, a wonderfully intimate study of just how it is baby fish learn to tell friend from foe. 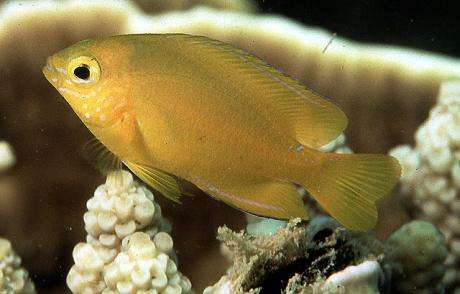 Most coral reef fishes spend their larval lives afloat in the deep blue home far from the reef. At the end of their larval stages, they recruit—that is, settle—onto a reef, where the cast of characters is significantly different from those they knew floating around in the open. Here we tested the ability of a juvenile marine fish to simultaneously learn the identity of multiple previously unknown predators. Individuals were conditioned with a ‘cocktail’ of novel odours (from two predators and two non-predators) paired with either a conspecific [from its own kind] alarm cue or a [meaningless] saltwater control and then tested for recognition of the four odours individually and two novel odours (one predator and one non-predator) the following day. 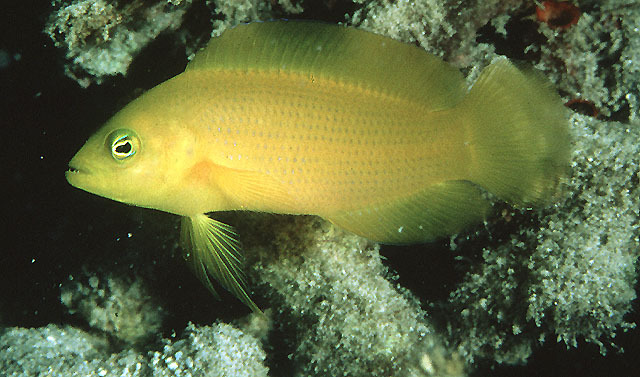 Photo by John E. Randall, courtesy FishBase. Photo by Richard Field, courtesy FishBase. 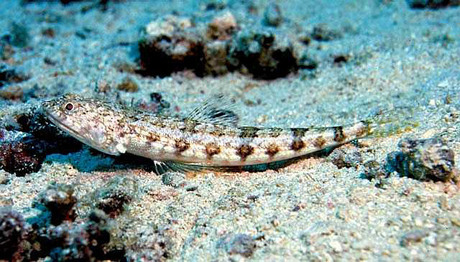 The experiments revealed that the fish conditioned with the cocktail odors plus an alarm cue made by their own species responded to the scent of a predator by reducing their foraging rate—an indicator of increasing vigilance. * Those fish conditioned to the saltwater controls didn’t. These results demonstrate that individuals acquire recognition of novel odours and that the responses were not due to innate recognition of predators or due to a generalised response to novel odours. 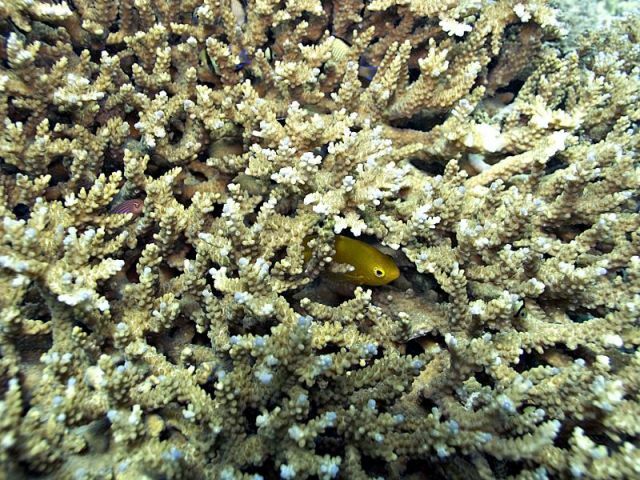 Lemon damselfish hiding in coral. Photo by Boogies with Fish at Flickr. On the real reef, obviously, some baby fish won’t learn fast enough and will get eaten. Others will learn false associations. Studies on associative learning have demonstrated that any unknown stimulus can be recognised as a predation risk through associative learning. 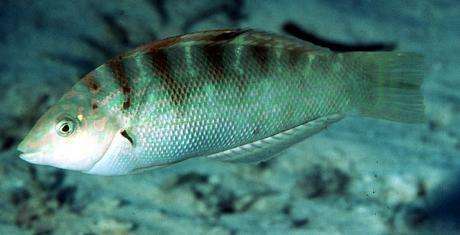 In natural environments, fishes are constantly exposed to multiple chemical odours. This study highlights the potential for ecologically irrelevant odours to be learned by association when present during a predation event. Responding to irrelevant cues will negatively impact an individual’s fitness. The lucky ones will live long enough to unlearn the false associations. It may pay at first to be overly cautious and learn all odours associated with an alarm cue as a predation risk when entering a new environment and then slowly learn which of those actually do not represent a threat. *CORRECTION:Thanks to lead author Mat Mitchell who corrected me here in writing that the fish did not jump into their terracotta pots but instead reduced their foraging time in response to the alarm cues and novel odors.